BANFF, ALBERTA – Canada – Not everyone enjoys careering down Class IV rapids while paddling furiously. For those interested in a more serene ride, try a rafting float trip with Banff Travel. Choose one of our popular float tours through the Canadian Rockies on your next Banff, Alberta vacation. Starting beside Bow Falls, and ending beneath the north face of majestic Mount Rundle, this 1-hour relaxing float trip is the perfect option for those without a lot of time to sightsee. 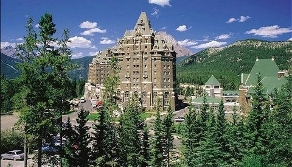 Meet us at the launch site, let us pick you up from the Banff Park Lodge or the Banff Springs Hotel. This 2-hour float begins from the base of Mount Rundle’s towering North Face, covering a section of the Bow River abundant in wildlife, waterfowl, and wildflowers. After your relaxing float tour, a 15-minute walk returns the group to the bus. Hotel pick-up and drop-off included. Enjoy a 3-hour leisurely river float with excellent wildlife viewing. Our guided tour makes a quick nature stop to view wildflowers and other flora. Join us on a twilight tour for unique alpine lighting and alternate wildlife viewing options. Don’t forget to bring your camera!